Centrum Wiskunde & Informatica: Can we reach Pareto optimal outcomes using bottom-up approaches? Classically, disciplines like negotiation and decision making have focused on reaching Pareto optimal solutions due to its stability and efficiency properties. Despite the fact that many practical and theoretical algorithms have successfully attempted to provide Pareto optimal solutions, they have focused on attempting to reach Pareto Optimality using horizontal approaches, where optimality is calculated taking into account every participant at the same time. Sometimes, this may prove to be a difficult task (e.g., conflict, mistrust, no information sharing, etc.). 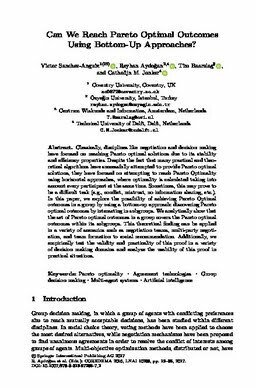 In this paper, we explore the possibility of achieving Pareto Optimal outcomes in a group by using a bottom-up approach: discovering Pareto optimal outcomes by interacting in subgroups.We analytically show that the set of Pareto optimal outcomes in a group covers the Pareto optimal outcomes within its subgroups. This theoretical finding can be applied in a variety of scenarios such as negotiation teams, multi-party negotiation, and team formation to social recommendation. Additionally, we empirically test the validity and practicality of this proof in a variety of decision making domains and analyze the usability of this proof in practical situations.